Senior Master Sgt. 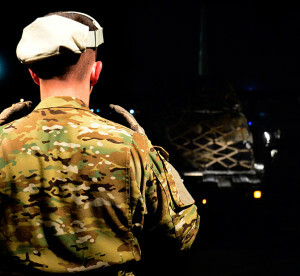 Kyle Gurnon, 737th Expeditionary Airlift Squadron loadmaster, directs cargo onto a C-130J Super Hercules at an undisclosed location in Southwest Asia before a mission to Qayyarah West Airfield, Iraq, Oct. 21, 2016. The 737th EAS flew the first coalition mission into the airfield since the start of Operation Inherent Resolve. The 737th Expeditionary Airlift Squadron flew two C-130J Super Hercules aircraft into Qayyarah West Airfield, Iraq, Oct. 21, 2016, the first coalition aircraft to land on the airfield since the start of Operation Inherent Resolve. The aircraft landed mere hours after repairs to the runway were completed, a project that’s been underway since Iraqi security forces retook the airfield from Da’esh in July of this year. The airfield, known colloquially as Q-West, serves as a staging hub for forces fighting to liberate Mosul from Da’esh. Its degraded state has made supplying front line fighters difficult, but Friday’s successful mission has helped ensure the base is ready for more robust operations. 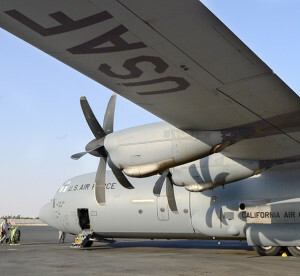 The C-130s were carrying firefighters and their equipment into the airfield in order to establish a fire rescue capability there for future flights. They also brought along ammunition, both for defense of the airfield itself and for ground troops moving into Mosul. Being the first aircraft to fly into a newly renovated airfield under cover of darkness presented a particularly difficult challenge, said Maj. Jeff Noble, 737th EAS instructor pilot and the aircraft commander for the flight. A C-130J Super Hercules assigned to the 737th Expeditionary Airlift Squadron sits on the ramp at an undisclosed location in Southwest Asia prior to a mission to Qayyarrah West Airfield, Iraq, Oct. 21, 2016. The 737th EAS flew the first coalition mission into the airfield since the start of Operation Inherent Resolve. Despite the challenges, Noble and his crew felt confident about the flight due to all the support they received from the rest of the squadron. Moving forward, Q-West will continue to play a significant role in supplying the fight in Mosul and beyond.